Hello and welcome back to the final inspiration piece for the 12 Tags of Christmas Funkie Junkie Style. A huge thank you to everyone who played along in my challenge this year. 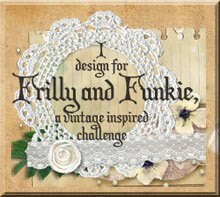 I have had so much fun with this challenge, seeing how you all interpreted my samples and visiting your blogs. I must say, you all have ben a huge inspiration to me and it's exciting to see you try new styles and techniques, pushing the personal boundaries of your art. I hope you have had as much fun as I have had. Thank you too to all the visitors. I know many of you were unable to play along, but have visited and left comments. I deeply appreciate your support of this challenge and hope that you, too, have found inspiration in my samples. For my final tag, I have again made a matchbook type folded thank you note. I really like this style for notes using the jumbo tags from my shop - fun to do and fits in an A2 size envelope! 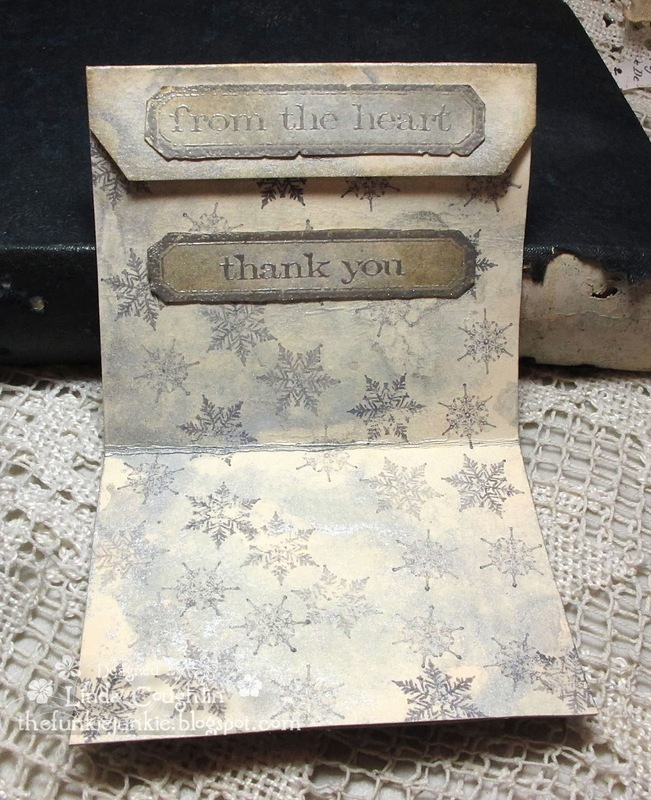 I used a Prima stencil to create an embossed border along the bottom of the note, embossing it with Wendy Vecchi's white embossing paste. When dry, I used Tim Holtz's marbled stains technique with Brushed Pewter and Picket Fence DS on both the front and back of the tag, then edged it lightly with Walnut Stain DI. I applied Frosted Film to Clearly for Art film and die cut it with the One the Edge Snowflake die. A light coat of Brushed Pewter DS was applied to the Frosted Film and I sort of rubbed it in with my finger to spread it out so it wouldn't be too thick. I wanted it to be somewhat translucent. After gluing it down, I hit it with my heat tool to warp it a bit for dimension. The inside is very simple. I stamped 2nd and 3rd generation stamping using Jet Black archival ink. 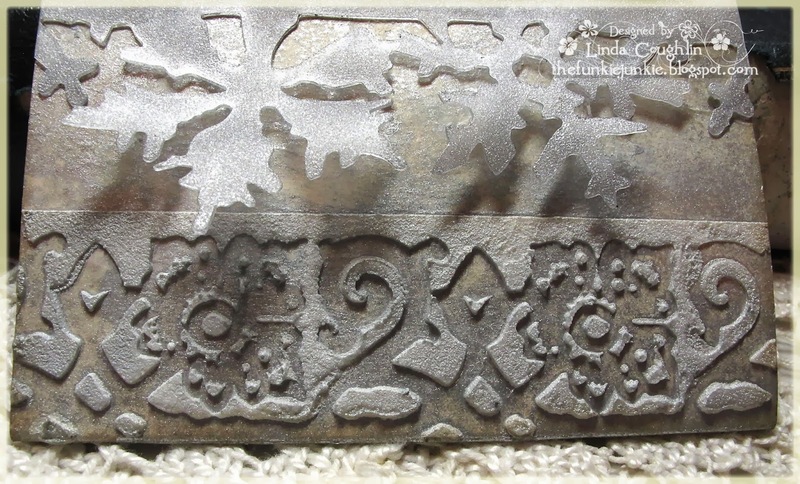 I know it looks grey/silver, but that's the result of stamping over the Brushed Pewter DS. These products used to make the tag above can be purchased at The Funkie Junkie Boutique were most name-brand products are always 20% below MSRP. Ooh, this is lovely, Linda - so subtly glamorous - wow! This is gorgeous! Love the frosted look, great inspiration! Love your thank you tag, Linda! As I said before, this has been a great challenge and I'm already looking forward to next year! Have a very Happy New Year! Linda, your final tag is completely gorgeous, I love the texture from the embossing paste & the subtle, wintry colour. I have thoroughly enjoyed taking part in the challenge & I hope there'll be another one in 2014. Thank you for all the inspiration & Happy New Year. A fabulous finishing tag Linda! I love the embossing & your gorgeous background! Thanks for this year's wonderful challenge, & for all of your beautiful, inspirational tag art. Wishing you health, happiness & peace in 2014. Such a beautiful tag/card. Great way to give thank you notes. Thanks for all your inspiration. I have very much enjoyed all your tags and cards this season. Happy new year!! Beautiful! I love how it opens up! Happy new year to you, and may it bring you many blessings of health and happiness! The Tag Studio - we offer engraved pet id tags, Id Tag For Dog and cat ID tags using the best materials on the market. I don't know whether to celebrate or cry now that it's over :( I have had the most wonderful time crafting via your inspiration Linda and I already can't wait to see if you do it next year too. 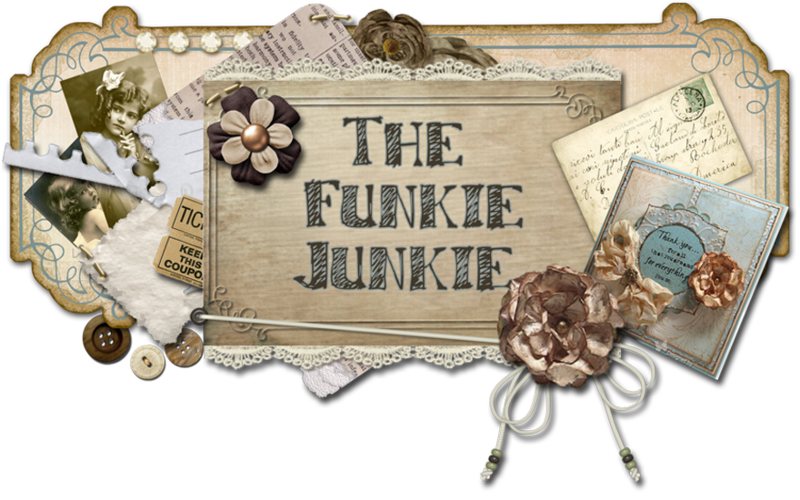 I truly think this is the longest crafting tradition I've ever had, following you at The Funkie Junkie and it's been fabulous. Your bonus tag 2 is sensational! Big hugs and HAPPY HAPPY New Year to you. 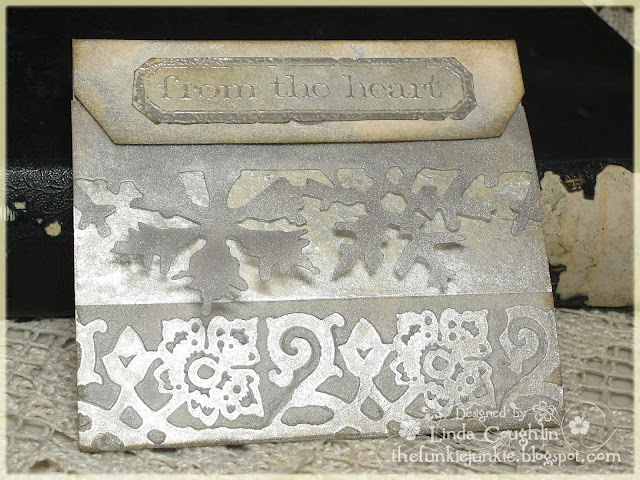 It's been an absolute joy, Linda - thank you so much for sharing your glorious creativity and inspiring so many amazing works around Craftyblogland. 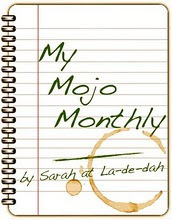 I've loved creating, and I've loved seeing what everyone has been creating... what a wonderful thing it is you do here! Thank you.